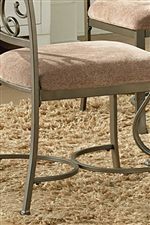 The suncatcher dining side chair is truly unique, constructed from scrolled metal, stained wood, tinted glass, and upholstered in a plush, pale pink fabric. Semi-circle stretchers at the chair base mimic the scroll detailing of the chair back and give balance to the overall design. Feature these chairs in a room with plenty of natural light and note how the suncatcher glass inserts catch and refract the light. For a complete dining set, pair these chairs with the dining table from the same collection (TP450B+T). 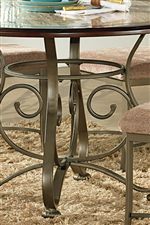 The Thompson Metal and Glass Suncatcher Dining Side Chair with Upholstered Seat by Steve Silver at Walker's Furniture in the Spokane, Kennewick, Tri-Cities, Wenatchee, Coeur D’Alene, Yakima, Walla Walla, Umatilla, Moses Lake area. Product availability may vary. Contact us for the most current availability on this product. The Thompson collection is a great option if you are looking for Traditional furniture in the Spokane, Kennewick, Tri-Cities, Wenatchee, Coeur D’Alene, Yakima, Walla Walla, Umatilla, Moses Lake area. 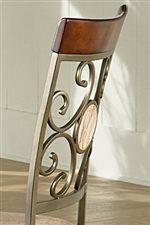 Browse other items in the Thompson collection from Walker's Furniture in the Spokane, Kennewick, Tri-Cities, Wenatchee, Coeur D’Alene, Yakima, Walla Walla, Umatilla, Moses Lake area.